The Little Tennesse River runs through the Needmore Game Lands along Needmore Road in Western NC. 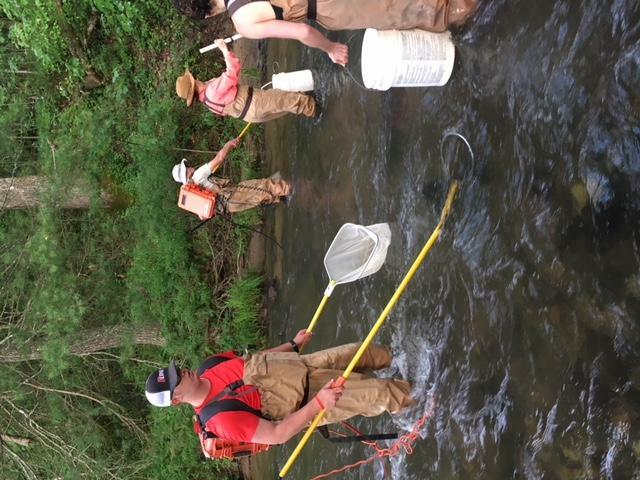 The team of volunteers uses a fishshocker and nets to study the fish in Middle Creek in Macon County. The team keeps track of how many fish of each species are found in the creek. 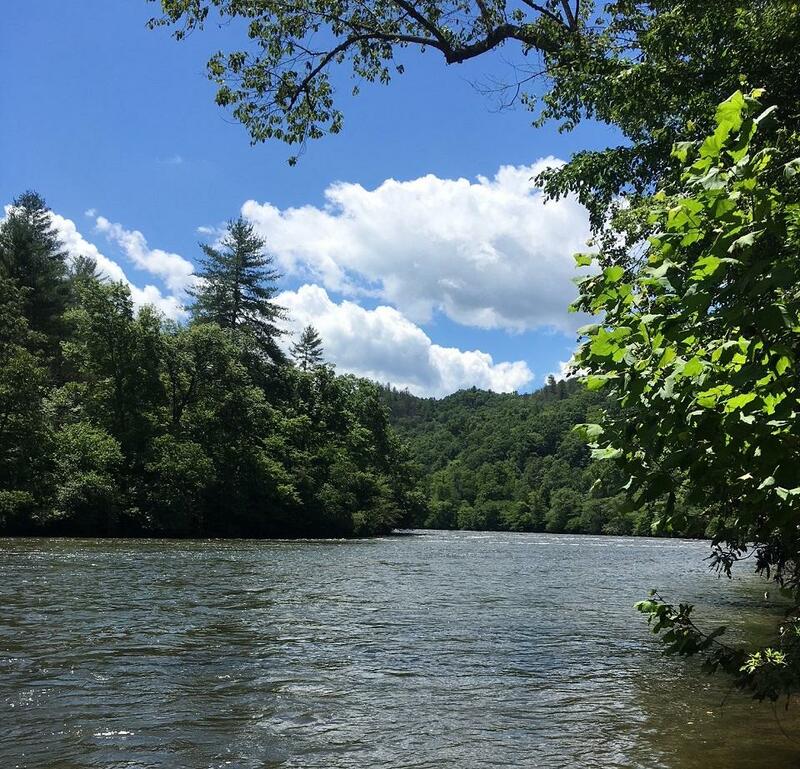 BPR's Lilly Knoepp talks to experts at Mainspring Conservation Trust, NC Wildlife Resources Commission and citizens about the conservation effort to save the Little Tennessee River over the last 25 years. This conservation effort helped preserve the Little Tennessee River to make it one of the cleanest rivers in the Blue Ridge Mountains. This year’s forum, organized by Mainspring Conservation Trust, Coweeta LTER and Franklin Forward!, focused on how river’s health has changed since that first conference and looked forward to the river’s future. Kay Coriell was at the conference 25 years ago. “There was just universal support for it, everybody just got on the bandwagon,” says Coriell, who describes how businesses and activists all saw the need to keep the river safe as the population of the area increased. A Franklin resident, she is still volunteering for conservation organizations in the area like Mainspring and the Friends of The Greenway. 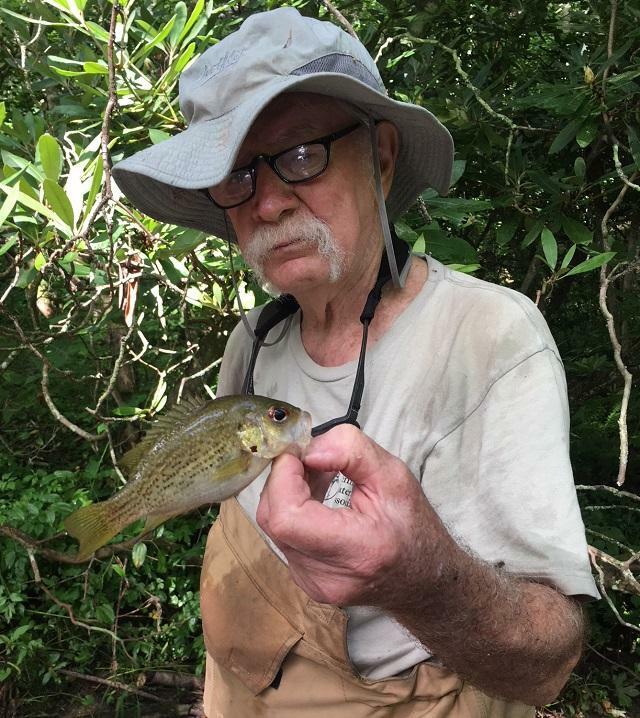 Dr. Bill McLarney has been studying the fish and waters of the Little Tennessee Watershed for about 30 years. Dr. Bill McLarney, was one of the organizers of the original conference. He has been studying the fish of the Little Tennessee River watershed since about 1988 as a scientist and a fisherman. He received an award for his years of service from the town of Franklin at the event. 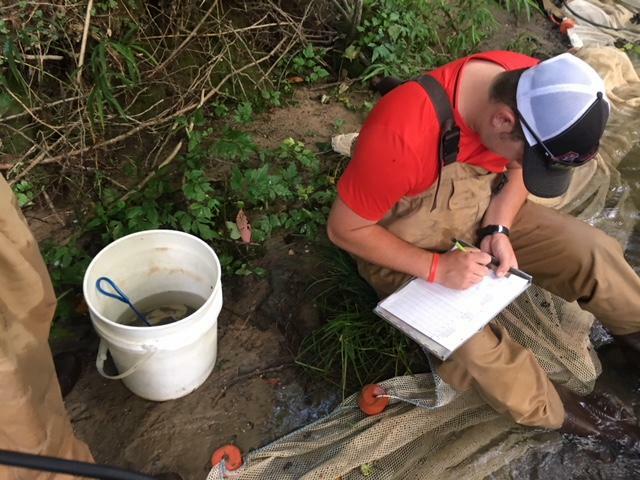 McLarney spends his time doing biomonitoring surveys on the streams and creeks of the Little Tennessee Watershed. That means he and his team track the health of the river by looking at the fish and organisms that live there. They often use a fish shocker, an electrically charged staff which temporarily stuns the fish in its current. This gives McLarney and his team time to scoop up the fish in nets and catalog them for their data. MClarney says that these surveys allow the wildlife to help them determine the health of the river. “That’s when you do these sociology type interviews, ‘Hey fish, what’s wrong here?’,” explains McLarney, as he describes how he can determine the health of water by the numbers of native and nonnative species that he finds in the water. For example, the central stoneroller, a spotted fish that predominantly eats algae which needs sunlight to grow. So if there are an excessive numbers of stonerollers in the creek, the you could conclude that the water is now less shaded than the year before, explains McLarney. This kind of information can be used to tell if the water has become unlivable for sensitive species - and potentially how to fix it. Urbanization and agriculture have changed the river. Conserving the water quality of the Little Tennessee River is one of the main goals for Mainspring Conservation Trust. McLarney leads Mainspring’s biomonitoring program as an aquatic biologist. The land conservancy and trust was sparked at the original water forum. It is the current incarnation of the Little Tennessee Land Trust, explained Sharon Taylor, executive director of the nonprofit. She says conservation in the area has come a long way since then. “When the Mainspring Conservation Trust was formed in 1997 there was not a foot of conserved land from its headwaters in Georgia to the Fontana Dam in Swain County, now there are 35 miles of riverfront. We are really proud of that number,” says Taylor. Taylor says that they have had a hand in conserving over 28,000 acres of land but the majority of the land that is conserved on the river is a part of the Needmore Game Lands along the Little Tennessee River. McLarney took BPR out to Needmore to share what makes the land so special. The game lands along the river total more than 4,500 acres and 30 miles of riverfront. A sandy gravel road runs along the length of the water so that you can see the clear blue water and wide river rocks between the trees as you head out of Macon County toward Bryson City in Swain County. “We’re sitting out here at an example of boring is good. If you graph the data it’s just about a flat line. Which is just about the most boring thing you’ve ever looked at and it all good,” says McLarney. He explains that consistent data in the species of the river means that the current level of preservation of the river are keeping it healthy. “It also tells me that the acquisition of the Needmore tract was a very wise move,” he says. Needmore is seen as the flagship project for Mainspring explained Paul Carlson, who was director of the land trust until 4 years ago. Carlson sketched out the history of the saga beginning on Christmas Eve 1999 when Duke Energy announced their plan to divest the land which had been purchased as a spot for another hydroelectric dam to fall in line with the dams at Lake Fontana and Lake Cheoah. Studies on the Needmore tract documented unique and endangered species living in the area such as the spotfin chub and the threatened sicklefin redhorse. The endangered Appalachian elktoe mussel only lives in the freshwater of the Upper Tennessee River system, however, researchers fear the mussel has been lost in this area. What are now the Needmore Game Lands have been a local favorite for hunting and recreation as long as anyone can remember. Public support for preservation pushed the Macon County commissioners to lobby for a resolution to request a full conservation solution for the land from Duke Energy in 2000. In 2001, Swain County commissioners followed suit with a parallel resolution. In 2004, after much fundraising and partnership between NC public organizations such as the DOT, the Needmore property was bought for $19.2 million dollars, says Carlson. It is now owned by the state and maintained by North Carolina Wildlife Commission. This effort has preserved the river keeping safe almost all of species who have lived in and around water for the last 200 years, says Andrea Leslie, mountain habitat conservation coordinator North Carolina Wildlife Resources Commission. 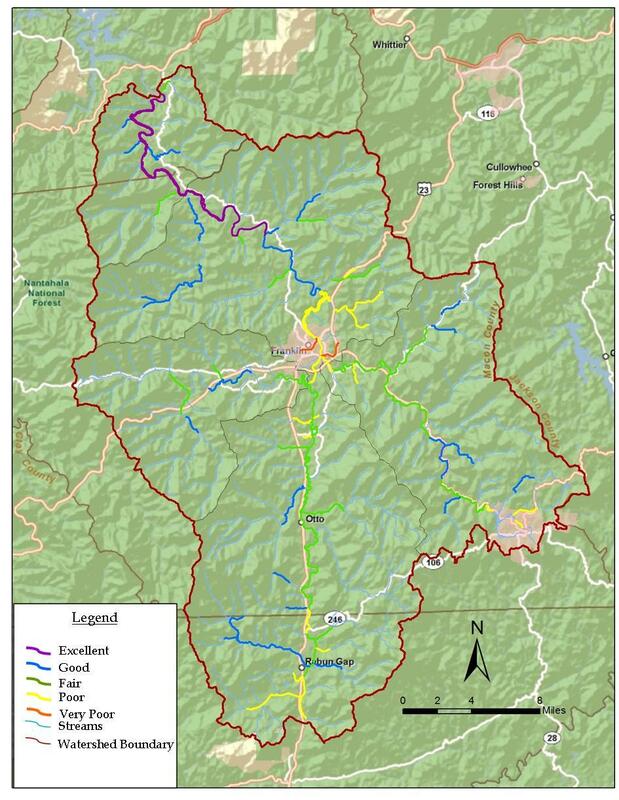 Map of the Little Tennessee Watershed to Fontana Reservoir with water quality data for 2018. Beyond the flora and fauna, this conservation is important for humans too. The health of the river depends not only on conservation but on the way that people use the river whether that is for kayaking, fishing or hunting. Twenty-one-year-old Zach Tallent ,who works with McLarney at Mainspring as an intern, has been fishing for as long as he can remember. This year, he will be the president of the Bass Fishing Club at WCU and he plans to follow in McLarney’s footsteps through his degree in Natural Resource Management.